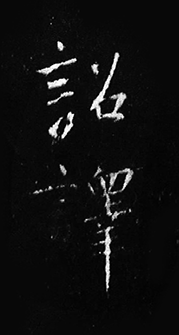 In Tanahashi (2014: 96) the image above is captioned, "The earliest known rendering of the Heart Sutra. Carved in 672. Stone Rubbing". The List of illustrations adds "Public Domain" (xi). The discussion of this inscription says "Xuanzang's Heart Sutra was carved on the monument erected by Emperor Gao in 672 at the Gaofu Monastery, Chang'an." (81; sic). This statement is credited in the notes to "Ibid., 562", i.e., Fukui (2000: 562). I don't have access to Fukui (2000) yet, so I set about trying to track down this "public domain" image mainly in order to compare the text with other Chinese Heart Sutra texts, but also because I was intrigued that it might be the earliest dated Heart Sutra. You might think that a public domain image of the "The earliest known rendering of the Heart Sutra" would be of considerable interest and therefore be easy to find. Not so. Initially, I could find no images of this text on the internet, except for a badly cropped version showing only the upper half. Note 3 Jan 2016. I was mistaken about this image being cropped. The text is all there but is a little more compressed that the image above. I will add more about this other image below. So I wrote to Shambala Publications who kindly sent me a high resolution image. The author himself has not replied to my questions about the provenance of the image, however. So I had to find out for myself. The first step to finding out more, was to try to clarify the information supplied in the reference. There were two Emperors of the early Tang called "Gao". To coincide with the year 672 CE, Tanahashi must be referring to 唐高宗 Táng Gāozōng, i.e., Gāozōng of the Tang Dynasty (628 – 683). Gāozōng was the third Emperor of the Tang Dynasty. He is usually considered a rather lacklustre emperor. After a series of strokes, his wife, Empress Wu 妾皇后, more or less took over running the state, then after he died she became the first Empress. Where Gāo, like previous Tang emperors, was not very supportive of Buddhism, Wu found in it her justification for being a female emperor in deeply patriarchal China. At first I could find no reference linking Gāozōng to this inscription. At the end of the inscription however, are two seals. The practice of adding seals to documents for authenticity may have begun with Gāozōng's father, 唐太宗, i.e., Emperor Tàizōng of Táng (r. 627-649). It seems to have been related to his interest in the calligraphy of Wang Xizhi (see below). Chinese seals are carved, usually into soft stone, with characters in the Seal Script, an archaic form of Chinese writing still used for decorative purposes. Unlike the inscription itself, the forms of these seal characters are often quite different from the modern ones. Reading seal script is an art in itself. Identifying the characters in these seals seemed like it might be illuminating. "Yes this is 高堅之印, the seal made by a very famous seal artist Mitsui Takakata 三井高堅". (@Shugendo Canada). So here the character 高 is, in fact, Japanese taka(i) "high, elevated". And Seal one, in fac,t reads "Seal of Takakata". Mitsui Takakata (1867-1945), aka 宗堅, Sōken, was a Japanese industrialist and art collector (note that in Japanese the Kanji 堅 can be pronounced kata or ken). He was a senior member of the Mitsui Zaibatsu, one of the largest corporations in the world at the time. He also had strong artistic leanings: "Takakata was a talented calligrapher versed in classical literature and an amateur epigrapher with a particularly good knowledge of seals." (Sherman 1982). Below are some examples of seals he created, supplied by my informant. The one of the left bears a striking resemblance to Seal One. Takakata was responsible for collecting perhaps 500 rubbings of stone inscriptions now held in the East Asiatic Library, University Of California, Berkeley (Mitsui was broken up by the post-WWII government and forced to divest itself of many assets, which meant selling a large chunk of their extensive library). I could not locate the rubbing from Tanahashi in EAL collection, though it contains several examples of the Heart Sutra or 心經. It seems that Mitsui Takakata was the person who did the rubbing that appears in Tanahashi (2014). He must have stamped it with his own seal afterwards. We still don't know when he created this image or where the original rubbing is. In the second seal we may have 安唐. 唐 means Tang, the name of the Tang Dynasty which is the Dynasty under which Xuanzang lived. Or it may be 安適. Opinion was divided amongst commentators and neither option produced much insight into whose seal this is. The two seals are very different in style, so perhaps this seal was part of the original inscription? In any case I could not learn anything further about Seal Two. Update 3 Jan 2016. The plot thickens a little as I discovered, by paying attention, that the other image of a rubbing found on Wikimedia shows what may well be the original rubbing that the image in Tanahashi is based on. The image here is rather indistinct, but a very hi resolution image is available via Wikimedia. Here there are 40 short columns, while in Tanahashi there are 27 longer columns. I'm not sure if this is a separate rubbing or if this is the model used for creating the image in Tanahashi. If so, it has been cleaned up substantially. There's a lot more noise in the Wikimedia image - white pixels surrounding the characters. I've tried looking specifically at the stray pixels around the characters - since the characters themselves are more or less identical - but the Tanahashi image has either been cleaned up in some way (perhaps using photoshop) or they are different. Note that the Wikimedia image has no seals. Returning to the description in Tanahashi (2014), "Gaofu Monastery" was a brief mystery in its own right. In fact, it is a mistake. The author, or perhaps the typesetter, has taken the name Gao from the emperor and mixed it up with the name of the monastery. The monastery is called 弘福寺 Hóngfú sì (Great Good-fortune Monastery), a place closely associated with Xuanzang. It was where he started his translation work on returning from China. Later, he moved to 西明寺 Xīmíng sì (Western Bright Monastery). "In 652, at Xuanzang's request, Gaozong authorized the erection on the temple grounds of a five-story Indian-style stūpa, which was built as a brick-covered earth core. After the stūpa was completed, the two steles incised with the imperial texts were installed in a stone chamber on its top floor." Each version of this story that I have uncovered seems to have slightly different details. Emperor Taizong who was originally fascinated by the calligraphy of 王羲之 Wáng Xīzhī (303–361), a Chinese calligrapher traditionally referred to as the Sage of Calligraphy (書聖), and became a collector of his work (Powers & Tsiang 2015: 299). In 2010 an example of this calligraphy sold for $46 million (BBC News). In 648 Taizong issued an edict as the preface to the Chinese Tripiṭaka titled, Preface to the Sacred Teaching 聖教序 (781 characters). It was this text that was initially inscribed in stone on a stele. According to Powers & Tsiang (2015), two versions were created, one based on the calligraphy of Chu Suiliang 褚遂良 (597-658) in 653 and a more elaborate one, by Huairen, based on the calligraphy of Wang Xizhi. Perhaps the Heart Sutra was added by the pious Huairen? All sources agree that it took 25 years to assemble all the characters needed for Huairen to compose the full text in this way (so collecting the characters must have begun in 647 at the latest, which is during the reign of Taizong and six years before the first stele was completed). When a precise character could not be found its radical and parts were extracted from other characters so it could be constructed. The finished project (1903 characters) included the Heart Sutra that interests us here. The former preface was composed by Li Shimin 李世民, i.e., Emperor Tàizōng, and the latter by Li Zhi 李治, i.e., Emperor Gāozōng. The first steles stood at the southern entrance of the famous 大雁塔 or Great Goose Pagoda at 大慈恩寺 (Great Grace and Goodwill Monastery) (Sheng 2001: 87-88), which we mentioned in last week's essay as a monastery associated with Xuanzang's disciple Kuījī. A good deal more detail on the influence of the Imperial obsession with the calligraphy of Wang Xizhi on the development of writing in China can be found in Sheng (2011: 48ff). The characters are different styles and different sizes, a fairly random collection of mismatched characters. It becomes even more apparent when we look at variations of individual characters, for example of 不, 亦, and 無 respectively. This observation supports the idea that the rubbing in Tanahashi was created from the stele created by Huairen in 672. At this point it might we worth saying something about the Chinese practice of making inscriptions of sutras. Dhāraṇī texts (including the Heart Sutra) are the subject of Paul Copp's (2014) book, The Body Incantatory. Carved pillars with short texts including the Prajñāpāramitāhṛdaya and Uṣṇīṣavijayadhāraṇī Sūtra were very common in medieval China. Around the 7th century the writing down of texts for use as amulets worn as arm-bands or necklaces had become a specific practice and it appears that short texts, such as the Uṣṇīṣavijayadhāraṇī Sūtra and possibly the Prajñāpāramitāhṛdaya were composed especially for this purpose. The image on the right (taken from Sotheby's online catalogue) shows a typical stone pillar, octagonal and carved with the Uṣṇīṣavijayadhāraṇī Sūtra. One of Conze's Heart Sutra texts was a similar octagonal pillar discovered in Mongolia and published by Miranov in 1932. The Heart Sutra and Uṣṇīṣavijayadhāraṇī appear together on the famous Horiuzi Palm-leaf manuscript and in several other manuscript sources. See also Liying Kuo (2014), who notes that the second oldest Heart Sutra text is found engraved on a pillar erected in 702, during Wu’s reign. And recall that Wu could not justify her taking power through either Daoism or Confucianism and so sought legitimation through Buddhism. By this time the kings of Japan were also using Buddhism as a legitimating narrative for their kingship. So the inscription and, indeed, the Heart Sutra, more generally, needs to be seen in this light. It was distinctive in its way, but also fits into the context of a widespread popular practice. And it was in the context of clarifying this information that I came across the real prize in this research. Amongst the many searches for the image itself I turned up many references to the original stele now residing in the Forest of Steles Beilin, in Xian, no other images of the stele itself. Then, serendipitously, whilst looking for images of Dhāraṇī pillars, I chanced upon an image of another rubbing of the same stele held in a collection of rubbings at Harvard University Fine Arts Library. In the image below the Heart Sutra takes up columns 23-27 (counting from the right). "The stele begins with the title Da Tang Sanzang shengjiao xu. Next to the title, two important statements—―太宗文皇帝製 (Composed by Taizong, the Literary Emperor) and ―弘福寺沙門懷仁集晉右將軍王羲之書 (Monk Huairen in Hongfu Monastery collected the characters from the calligraphies of Wang Xizhi, General of the Right Army of the Jin dynasty [to engrave on this slab] are presented in one line. This statement of calligraphic authorship is followed by five individual bodies of text: the complete text of Taizong’s Preface (ten lines), Taizong’s reply to Xuanzang’s gratitude letter (one line), Gaozong’s Notes to the Preface (ten lines), Gaizong’s reply to Xuanzang’s gratitude letter (one line), and a paragraph [sic] from the Heart Sutra (five lines). Because of the distinctive nature of the text a comparison is relatively easy. The text of the rubbing in Tanahashi is the same as the text in this rubbing. 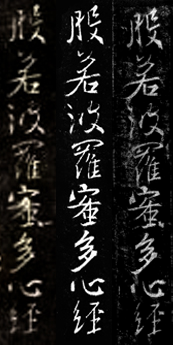 See image right comparing the title of the text - with Harvard on the left, Tanahashi in the middle, and the Wikimedia image on the right. I have tweaked the contrast in the Harvard image to improve the contrast (by adjusting the black, mid and white points using the "levels" tool in Photoshop Elements) Looking at this my impression is that the characters in the Tanahashi image have also had the contrast adjusted. The white of the characters is too white. Contrarily, the Wikimedia image shows texture in the white of the letters, which is what we might expect with an engraving. The third image complicated matters somewhat because we don't have enough information on the provenance of any of them to know how or even if they are related. We can say that the Harvard rubbing shows no sign of seals and that these must have been added to the rubbing at a later date, possibly by Mitsui Takakata himself, or perhaps by someone else. The original stele was more like a dhāraṇī pillar than a page of manuscript. This stele now stands at Beilin Museum in Xian and it is commonly referred to as the 集王聖教序并記 "Preface and the Notes to the Preface to the Holy Teaching with the Collected Wang's [calligraphies]" (Sheng 2011: 89). Sheng goes on to discuss the Preface in great detail (90ff). Sheng suggest that Taizong's preface was composed specifically for Xuanzang's translation of the 100 fascicle Yogācārabhūmi. Of the utmost importance for the history of the Heart Sutra is the note by Sheng (2011: 96) that "At the end of the main text, five high officials are credited with giving the translation of the sutra a proper elegance and finish... and ... the process of the afore named officials' finalizing and polishing the sutra's translation took place in 656". Thus the Xuanzangisms in the text (the spelling of 觀自在 and 舍利子, for example) may well have been added in tribute to Xuanzang rather than by him, but before his death in 664. We also know that although Emperor Gāo appreciated Xuanzang, more generally he was no fan of Buddhism and is, contra Tanahashi (95), unlikely to have thought of promoting the Heart Sutra. Gāo cancelled the translation program in the same year as Xuanzang died and thence turned increasingly to Daoism (Wriggins 2004: 203). This also means we can date T251, which is more or less identical to this text, to 656 CE at the latest. This is still long after Xuanzang returned from India and also after the date traditionally ascribed to T251 i.e. 649 CE. I have transcribed the inscription as it appears in Tanahashi, checking against the Harvard rubbing where possible. My version is shown below in a semi-cursive font (and repeated below in whatever your browser uses for a standard Chinese font). 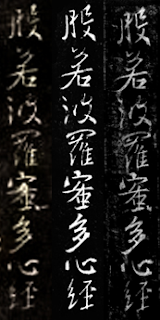 The text mainly follows Xuanzang's version and the traditional Chinese reading order - one starts at top right and reads down, then goes to the top of the next column to the left and finishes in the bottom left. It's like English writing with the page rotated 90° clockwise. 沙门玄奘奉 "Homage to Shāmen Xuánzàng." 沙门 shāmen here means “monk”. 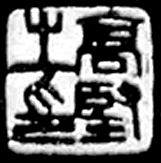 There are two separate characters below this that are indistinct in Takakata's rubbing and even less clear in the Harvard rubbing. The characters are difficult to read, but comparison with a number of other texts suggests that they are 詺 "named," and 譯 "interpret, translate". I'm not sure how to read them in this context. The Wikimedia image does not separate these characters out. Note 5.6.2018: 詔譯 means "a translation requested or sanctioned by the emperor". While 奉詔譯 "translated by imperial decree". So the Line 沙门玄奘奉奉詔譯 should not have a gap, and another inspection shows no gap in the Beilin Stele. 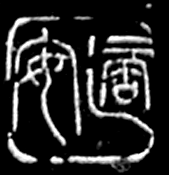 The line thus reads "The Monk Xuánzàng translated by imperial decree". I think this story shows how important good referencing is. Without accurate information it can be very difficult to track down the original, be it an image or a textual source. Tanahashi has not made it easy to locate this important version of the Heart, so seldom written about or studied in English. However, I believe I have now correctly identified the image, filled in many of the gaps in the information about its provenance, transcribed it and shown how it fits in with existing versions. Scholarship is partly about ensuring that those who come after you don't have to reinvent the wheel. If this is indeed the earliest dated Heart Sutra text, then it is extremely important in the history of the Heart Sutra. The Japanese Horiuzi palm-leaf manuscript is said to date from 609 CE, but this is unlikely to be true. The first European scholars to examine the ms. dated it to the 8th century on palaeographic grounds. Of course absence of evidence is not evidence of absence, but an earliest text dated 672 CE is consistent with Nattier's Chinese Origins hypothesis. If, for example, it really had been "translated" in the 5th Century by Kumārajīva we might expect an earlier inscription or some other corroborating archaeology. Not only do we have the first physical evidence of the Heart Sutra in the late 7th century, but we can also date the first commentaries to around the same time, i.e., shortly after the death of Xuanzang. Again, if the text were earlier we might expect a narrative source, such as the diaries of previous Chinese pilgrims to India to mention the text, but again the earliest source for this kind of evidence is associated with Xuanzang. As it is, the earliest Indian evidence, the Indian commentaries preserved in Tibetan, date from the 8th century. All of this is consistent with the text being composed or at least popularised in the 7th century, probably originally as an amulet for protection from misfortune. The status as an epitome of Prajñāpāramitā most likely came later and, in fact, the first commentators (i.e., 원측 Woncheuk and 窺基 Kuījī), understood the text to be an epitome of Yogācāra thought, unlike the Indian commentators who saw in the text either a Madhyamaka or Tantric epitome. Note 5.6.2018. It was announced in China in 2016, but not reported in the West, that two more stone steles have been discovered and dated to 661 and 669 CE. Both contain the line “三藏法師玄奘奉詔譯” bolstering support for Xuanzang's involvement in the text, since he died in 664 CE. However, a note of caution -- I have not yet seen anything to say how these steles were dated. Copp, Paul. (2014). The Body Incantatory: Spells and the Ritual Imagination in Medieval Chinese Buddhism. Columbia University Press. Roger Sherman. (1982). Acquisition of the Mitsui Collection by the East Asiatic Library, University Of California, Berkeley. Journal of East Asian Libraries, 67. [This article is a summary of the author's MLS specialization paper, Graduate School of Library and Information Science, UCLA, 1980].